As our animal rescue team entered a trash- and feces-filled house last Friday to rescue more than 50 dogs and cats from an internet pet seller in Rutherford County, N.C., they nearly stumbled over a kitten. The tiny Himalayan was weaving her way between their legs, as if trying to make sure she wouldn't be left behind. One of our team members who picked her up noticed that her baby blue eyes were encrusted with brownish debris and likely infected. And, like five other cats and dozens of dogs in that puppy mill, she was struggling to breathe in a room that reeked of urine. Sassafras, as the rescue team named the kitten, is now in the caring hands of Brother Wolf Animal Rescue in Asheville, N.C., where many people have expressed interest in adopting her. But thousands of other animals are suffering just like she was, sight unseen, at the hands of irresponsible breeders who provide puppies and kittens to internet mega stores. Mills like this one are financially enabled by an unsuspecting public – people who buy pets online, often never knowing the reality behind the soft, brown noses and warm bellies of the puppies and kittens. 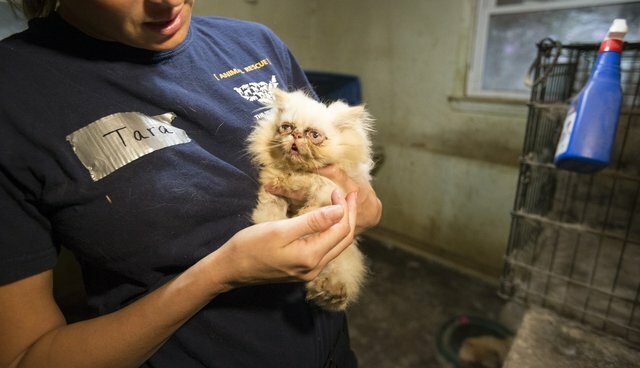 This North Carolina puppy mill was apparently selling puppies and kittens through a number of legitimate-looking websites. The sellers are extremely slick, often posing as groups of local prescreened breeders, and offering misleading guarantees. North Carolina in particular has become something of a hotbed for some of the worst puppy mill operators in the country, because there are no specific laws in the state to protect dogs sold directly to the public or online by commercial breeding facilities. This is, astonishingly, the 21st rescue that The HSUS has assisted with in the state since June 2011, this time with help from the Humane Society of Charlotte, Brother Wolf Animal Rescue, Cashiers Highlands Humane Society and Iredell County Animal Shelter. There's something very wrong in the Tarheel state on this issue. The HSUS has been making steady progress in fighting the puppy mill scourge across the United States. Last year, we won a major victory when the Obama administration agreed to extend federal oversight to thousands of puppy mills and kitten mills that do business online. This year we scored another victory when the administration imposed a ban on the import of puppies from abroad. Moreover, as our 101 Puppy Mills report released earlier this year pointed out, there are approximately 10,000 puppy mills operating in the United States and many of these sell puppies online. We have a long way to go before we can ensure that animals like Sassafras are never again raised in the kind of horrific circumstances that our rescuers encountered at that North Carolina puppy mill. You can rest assured that we'll keep up the fight to stamp out puppy mills. We'll continue to pass state laws to regulate puppy mills, and push the Obama administration for further regulation. We'll also keep working to transition pet shops from selling puppies from puppy mills into adopting out rescued dogs in need of loving homes. But we need your help. With the approaching winter holidays – the busiest puppy-buying season of the year-business is about to pick up for internet pet sellers. If you are looking to add a new, four-legged family member, make sure you visit the breeder in person to see how and where the animal was born and raised, or better yet, adopt from a shelter or rescue group. You and other highly attuned members of the public are the greatest bulwark against the mills and the internet sellers that do business with them.